‘It is also commonplace for landlords to demand an upward of one to two years rent in advance, with additional legal and agency fees, thereby putting rental accommodation at a cost majority of the urban poor cannot afford. Not only that, the executive order to leave is coming at a time when schools across the State just resumed for a new academic session. The disruption of children’s education is imminent should they lose their homes,’ the statement further read. According to Betty Abah, Executive Director of CEE-HOPE, ‘it is appalling to note the wars that are being deliberately waged against the urban poor under Governor Ambode’s administration. It is a huge disappointment because many voted him in as governor of Lagos State based on the sensational promises of inclusive development. The demolitions in Badia East and other communities across Lagos since the governor’s assumption of office in 2015, the recent ban on street trading; and now these forced evictions and demolitions in Oshodi, Ikoyi, and other communities make it abundantly clear that he is on a mission to marginalise the urban poor even further and make lives more difficult for their children,’ said. ‘On behalf of the children who recently resumed school, we call on the Governor, to halt the evictions and demolitions until meaningful engagement is had with all stakeholders to prevent needless suffering and ensure that the education of our children is not interrupted, ‘ she added. According to the United Nations Committee on Economic, Social and Cultural Rights, ‘the right to housing should not be interpreted in a narrow or restrictive sense which equates it with e.g. physical shelter as a commodity; but rather should be seen as the right to live somewhere in security, peace and dignity.’ Implicit in this duty to respect the right to housing is an obligation on the LASG to adopt all appropriate legislative, administrative, budgetary, judicial, promotional and other measures required to realize the right to adequate housing for all (which includes improving housing conditions within the state) prioritising for the most disadvantaged groups. A number of state agencies such as the State Ministries of Environment, Physical and Urban Planning, Lagos State Waste Management Authority, Kick against Indiscipline (KAI) – an environmental law enforcement unit, and the Civil Defence Corps, have been named as the executors of the state’s demolition policies. There are several substantiated reports of overzealousness, high-handedness and intimidation by officials of these agencies during the demolition and eviction exercises. 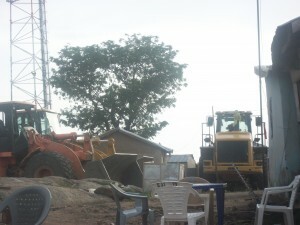 It was against this backdrop that SPACES FOR CHANGE initiated legal action challenging the propriety of the Lagos State Government to demolish privet homes and businesses in Badia community in September 2015 without provision of effective remedies – resettlement, relocation and rehabilitation of the affected residents. Adequate and reasonable notice prior to the eviction exercise. Legal remedies and legal aid to affected persons, or opportunities to seek redress from the courts.